A rare total solar eclipse will pass directly over Carbondale, IL on the afternoon of August 21, so Sones de Mexico Ensemble is heading to the path of totality to present Beyond the Music: A Musical Geography of Mexico outdoors at Lemus Turley Park, 109 N Glenview in Carbondale. The total eclipse occurs at exactly 1:21PM. There will be music both before and after, starting with Zenen Zeferino from Veracruz, Mexico with the Encuentro de Jaraneros of the Midwest. 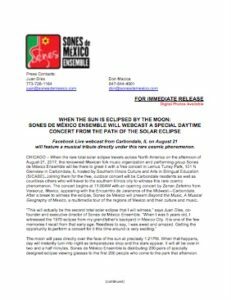 After a break to view the eclipse, Sones de México will perform beginning at 2PM. In addition to Beyond the Music, Sones de México will perform rarely heard selections from their 2013 concept album 13 B’ak’tun, a song cycle that revolved around the turning of the Mayan calendar. Can’t make it to Carbondale? Sones de México Ensemble will begin reporting from the scene via Facebook Live beginning at 1PM Central Daylight Time. Beyond the Music: A Musical Geography of Mexico is made possible with the support of the National Endowment for the Arts.